Manufactured from special PVC compound having extra toughness.Anti corrosive. PVC being an inert material most of the chemicals found in soil and water do not affect the casing and screen. We " Polymer Marketing Corporation " are leading supplier of Protector Well Casings and providing to our customer in best quality. With a firm commitment to quality, we are manufacturing a broad spectrum of Open Well Casing. We are leading supplier of Finolex Protector Well Casings and Screens. the finolex protector range of pvc plain casing and ribbed screen pipes is specially designed to ensure clean, clear water from bore wells, whether shallow or deep. 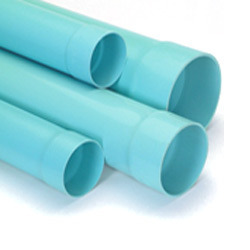 Protector range of PVC plain casing and ribbed screen pipes is specially designed to ensure clean, clear water from bore wells, whether shallow or deep. The Protector range is manufactured as per IS 12818 and DIN 4925 standards. c) SCREEN PIPES WITH RIBS Range from 40mm - 200mm. d) SDR 52 - For Well Depth upto 40Feet. e) SDR 35 - For Well Depth Bet'n 60 - 90 Feet.